Ah, yes, the sqrt/sqr in the r variable can be cancelled. Is the pic above (which also looks really nice by the way) the equivalent of my 2D ortho projection? Doesn't quite look like it, but then I wouldn't know what to expect from a different angle! Haha, I'm dying to see higher res versions now. To be honest, I know these things render so slowly, but I'm amazed they can render at all. Even plotting the simple pixel projection I did took around 2 hours in C++, so I'm quite impressed really, especially as it's raytraced. More CPU speed in computers would still really be nice though hehe. Is the pic above (which also looks really nice by the way) the equivalent of my 2D ortho projection? Doesn't quite look like it, but then I wouldn't know what to expect from a different angle! Even plotting the simple pixel projection I did took around 2 hours in C++, so I'm quite impressed really, especially as it's raytraced. More CPU speed in computers would still really be nice though hehe. i don't think we'll ever see a 100m times speed improvement, there are physical limits (if you don't believe this, ask yourself: why stop at 100m? why not 1000000000000 quadrillion times faster?) i'd say we have another 1000x or so to go, at most. oh and about physical limits, do you really think that the speed of light will be broken in the year 2600? it's really fun taking vertical slices of the shape too, a nice project would be to render and assemble a whole bunch of slices to really get an idea of the 3d structure. i think i finally understand the formula btw, it's basically reproducing the dynamics of the mandelbrot iteration in the 2d complex plane (doubling the angle comes from the z^2, adding the offset comes from the starting point) and doing analogous transformations in the other spherical co-ordinate; because of this there are actually entire families of 3d mandelbrots, depending on your choices of angle coefficient and offset. moreover, i've been thinking of visualising the whole 4d object. yes, 4d: actually, at each point in space there is a scalar potential, which can be interpreted as density (like a cloud). since i plan to simulate atmospheric physics (in particular rayleigh scattering - which is what's responsible for blue skies and red sunsets etc.) 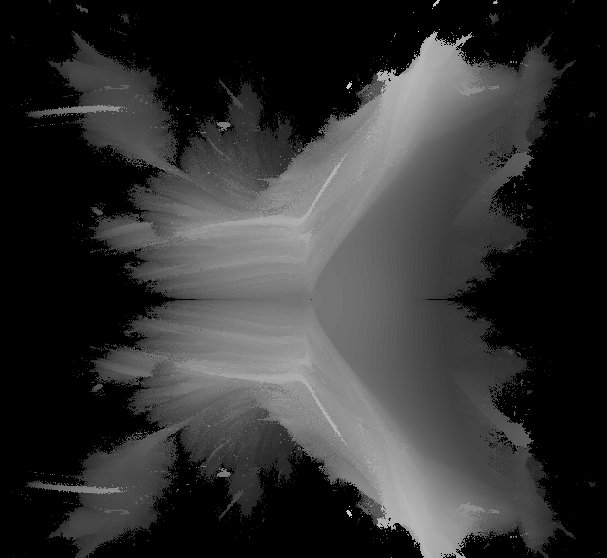 anyway, this will serve as a really nice volumetric dataset. i'll definitely pre-render it to a grid though, because it's SO damn slow! that ought to look pretty cool, and would actually be way faster than the method i'm using here. Oh so it is?? But that previous grey one hardly looks like the next gold one. Not even slightly symmetric for instance. Are you sure? Excellent! This is definitely a 3D version of the ortho one I did Can I ask you a favour? Can you render it at higher resolution, and also veer the light source to one side, so that the left part of the fractal is brighter than the right, so that we can see a more '3D' like picture. Maybe also use the grey material too, as it better reflects the subtle blue sky light source. How does that compare to photon mapping or radiosity out of interest? Yes that prediction for 2040 is looking slightly optimistic now (that article was written 2 years ago). It's quite a shame the increases have been so small lately At least there's parallel processing which will good for raytracing, and radiosity type effects (I hope). Nice!! I'd die to zoom right into that top-left little cave part next to the spindly part to see how much of the detail has survived the move to 3D. If you have time of course. I don't want to eat up all your CPU time! and doing analogous transformations in the other spherical co-ordinate; because of this there are actually entire families of 3d mandelbrots, depending on your choices of angle coefficient and offset. I wish!... As good as it looks, this beast is far from the real thing, because most of the infinitely complex details haven't survived the Z axis. Unfortunately, they still look as though they've been 'smeared' over or lost completely. However, there's a chance some of the infinite detail has nearly survived in smaller portions of the set. For example, that cave part near the top looks as though there could be some interesting stuff. Again, I doubt it though. Ace. Can't wait to see some more pics of this thing! sure, it'll take a while though, once i've set up the scene to be rendered (i do everything with code, and tweaking the camera xyz etc is labourious). there's no light source in the scene per se, it's all just skylight. i do have light sources though, and will use some. they are totally equivalent: radiance (which is the radiometric quantity corresponding to what we see) is invariant along directions, so it doesn't matter whether you simulate light going from the eye to the lights (path tracing), from the light to the eye (light tracing), or both (bi-directional path tracing). what i'm doing there is a 100% accurate simulation of diffuse light transport, which is really easy actually. photon mapping is a full global illumination algorithm, in that it can simulate all modes of light transport. however it is biased (roughly, you can't be sure it's converging to the right image) and i personally dislike the algorithm, it's quite storage intensive and subject to a lot of approximations that make the result uncrisp. radiosity only works with polygonal scenes, and only simulates diffuse light transport. so it's not at all applicable to scenes having curved (let alone fractal!) surfaces. i've not heard of inverse perspective before, can you explain how it works? yup, but we've already mostly exhausted the "free ghz" ride, and eternal multicore scaling isn't a given. so there definitely is a limit, and lithographic microprocessor manufacturing is slowly approaching some kind of peak too... all other techs (quantum, biological, nano, ...) are a pie in the sky so far. 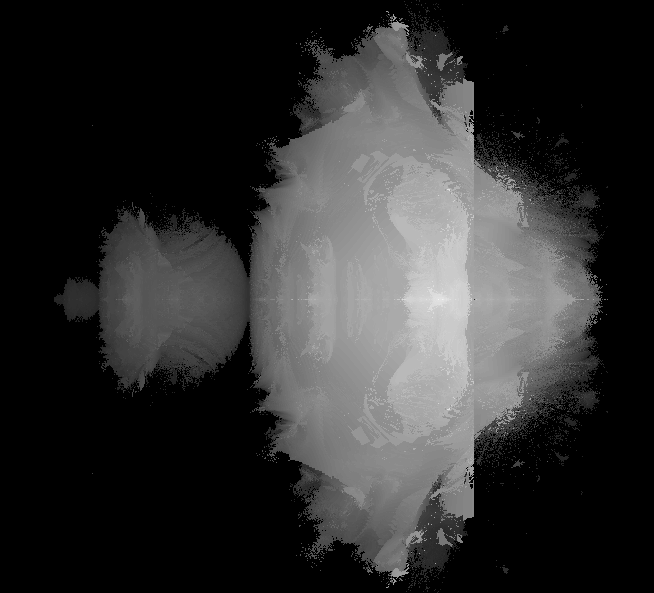 the way to visualise this thing in realtime is to precompute a volume... i should get to doing that. Maybe there's a way of working out a distance estimation for it ? Can I ask you a favour? Can you render it at higher resolution, and also veer the light source to one side, so that the left part of the fractal is brighter than the right, so that we can see a more '3D' like picture. Maybe also use the grey material too, as it better reflects the subtle blue sky light source. Does your algorithm even do exotic stuff like account for red/blue shift for rainbow effects? How about if you throw more CPU time at it. Is accuracy increased proportional to the CPU time? Sounds ace. I have to say, some of these, although grainy, do look very realistic. Usually, in 3D, lines of perspective converge to a point. Orthographic images on the other hand don't - everything in the back is just as big as everything at the front. Now imagine one step further than even this. lines of perspective would fly away from each other (actually they would converge, but only behind the viewer). Parallax would look really strange and interesting like this. I was semi-surprised to see the idea is already out there on Wikipedia. Even if you have to forego some of the more realistic lighting effects for quicker speed, I'd love to get a closer eye on the detail. By the way, what's the building block of these images? Billions of little cubes? Polygons? Pure mathematical curves? I can't imagine the latter, since the difficulty in translating from fractal to curve is daunting (at least for me). What does that have, that your algorithm lacks? Hi David, still love to see that quaternion technique at creating the 3D Mandelbrot set. Any attempts so far? Meanwhile, here's another 2 failed attempts. As before, brightness represents the Z axis. first off, a minor technical correction due to my bad wording: radiance isn't "invariant along direction", it's invariant if you swap the directions; i.e., the (differential) radiance from a to b is the same as the radiance from b to a. so if you have a path of light between the eye and the camera, then it doesn't matter which point is the source and which is the sensor. this symmetry is concisely summarised in this this paper. regarding spectral effects such as redshift and dispersive refraction, yes my renderer can (efficiently!) do both. even polarisation of light can be taken into account. I have to say, some of these, although grainy, do look very realistic. yeah, unfortunately naively rendering fractal surfaces without distance estimation is several hundred times slower than rendering "normal" scenes. it's working directly with the procedure you gave, same as your images were produced. your rays were going out in parallel bundles, mine leave in perspective and bounce around the scene looking for light sources - that's about it. it's difficult to say exactly what technology they're using because they're obviously not going to disclose it, but it's hypothesised that they're also using (some variant of) metropolis light transport. there are a bunch of renderers out there which work in the same way, as does mine. regarding features, mine can't be compared to any of them as i've hardly worked on it at all and have absolutely no hooks for polygonal data (let alone import from 3ds max, maya, etc. ), no material system, no support for textures, no nothing basically this is why i need to work on it. however, wrt the core algorithm i think there's rough parity; i just need to take that powerful engine and do useful things with it, these simple renders i've done don't even scratch the surface (as you'll see looking at maxwell render's gallery).